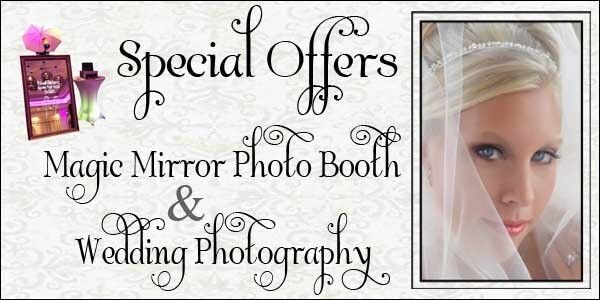 The best photo booth in Indianapolis is now available to entertain your guests at DeFabis Photography! Just imagine, your guests will walk up to the full length mirror and colorful animations and voice prompts will invite them to engage in a magical, interactive “selfie” experience resulting in a personalized photo keepsake of your wedding. Sorry, But Old School Photo Booths Just Became B-O-R-I-N-G.
First, the Magic Mirror is definitely more aesthetically pleasing and is more suitable for decor at a wedding. 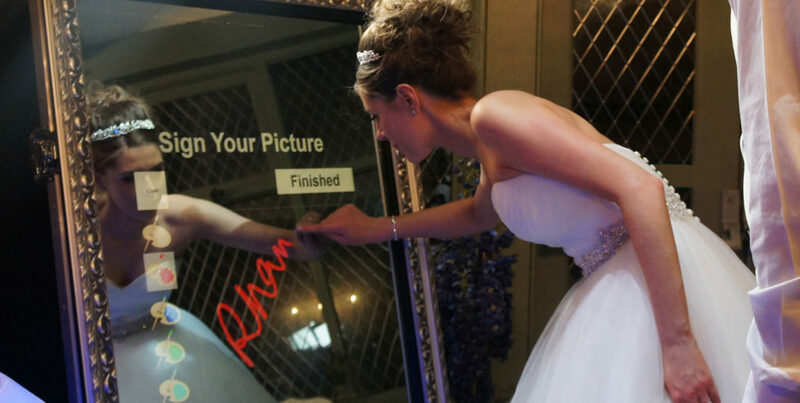 The Magic Mirror uses the latest photo and touchscreen technology to provide wedding guests an interactive experience that will astound. 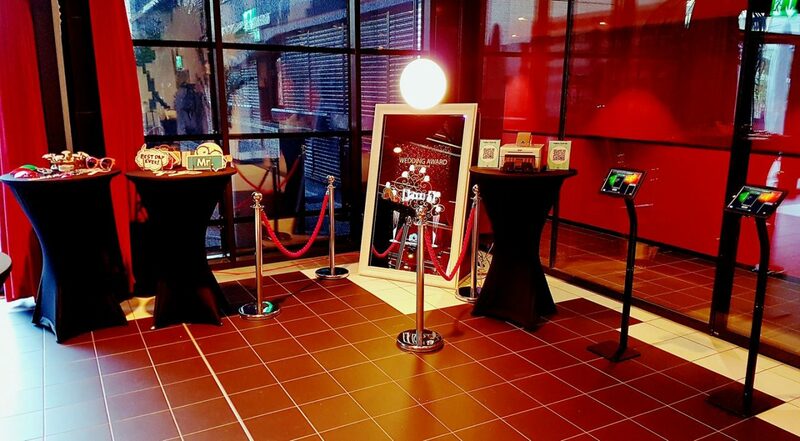 The Magic Mirror experience will result in a more interactive experience for your guests. We program The Magic Mirror photo booth with dozens of animations so each guest will experience a different session than the previous one. The interactive features include voice guidance, a signature feature, and screaming contest, just to name a few. The Magic Mirror Photo Booth is much more than just a photo booth. Retake photo feature – This feature allows users to retake photos quickly and seamlessly, ensuring every user walks away satisfied. This feature also allows users to reset the workflow. Texting Feature – This new feature allows the user to text the image directly to their cell phone. Images can then be uploaded to any social media site desired. Signing and stamping feature – This features makes is possible for users to personalize their keepsake. In essence, it allows users to have their names printed on the final image, which means users have to sign or draw their name directly on the mirror photo booth first. Screaming contest feature – Your guests will engage in a screaming contest while taking pictures. Unsurprisingly, the contest often produces some hilarious pictures, making the photo-taking experience fun and exciting. Amazing LED Ring — Guests will be amazed by the LED ring. The primary function of the LED ring is to get users to look directly into the camera lens. Multi Layout Selection – This feature allows your guests to choose to take 1 – 2 – 3 photos all with a custom overlay of your event color and themes. Magic Mirror Photo Booth is located in Indianapolis IN, but we will travel anywhere in Marion and the surrounding counties at no charge. We have no travel fees for Marion and the surrounding counties including; Indianapolis, Lebanon, Carmel, Muncie, Lafayette, Kokomo, Richmond, Ft. Wayne, Anderson, Fishers, Avon, Greenwood, etc. Events outside of our local coverage area may incur a small travel fee.